Disaster relief (or emergency management) refers to the process of responding to a catastrophic situation, providing humanitarian aid to persons and communities who have suffered from some form of disaster. It involves dealing with and avoiding risks and preparing, supporting, and rebuilding society when natural or human-made disasters occur. In general, any emergency management is the continuous process by which all individuals, groups, and communities manage hazards in an effort to avoid or limit the impact of disasters resulting from the hazards. Actions taken depend in part on perceptions of risk of those exposed. Effective emergency management relies on thorough integration of emergency plans at all levels of government and non-government involvement. Activities at each level (individual, group, community) affect the other levels. It is common to place the responsibility for governmental emergency management with the institutions for civil defense or within the conventional structure of the emergency services. International humanitarian associations, such as the Red Cross, provide aid to disaster victims throughout the world. While disasters are by definition tragic, resulting in great loss of material goods and property, as well as injury and loss of life, disaster relief is a truly human response. When people see those in need, even far away and in circumstances entirely foreign, the desire to help comes from the empathy felt for human brothers and sisters. As technology and human consciousness has developed, the desire and ability to help others, crossing geographical distance and cultural and national boundaries has also developed. Disaster relief is the monies or services made available to individuals and communities that have experienced losses due to disasters such as floods, hurricanes, earthquakes, drought, tornadoes, and riots. A disaster may also be defined in sociological terms as a major disruption of the social pattern of individuals and groups. Most countries have agencies that coordinate disaster relief and planning. Many have statutes that define appropriate procedures for disaster declarations and emergency orders. Such statutes also empower relief agencies to utilize local resources, commandeer private property, and arrange for temporary housing during an emergency. The term "disaster" has been applied in the United States and many countries throughout Europe in a broad sense to mean both human-made and natural catastrophes. Human-made catastrophes include civil disturbances such as riots and demonstrations; warfare-related upheavals, including those created by guerrilla activity and terrorism; refugee crises involving the forced movements of people across borders; and many possible accidents, including transportation, mining, pollution, chemical, and nuclear incidents. Emergency Management is one of a number of terms which, since the end of the Cold War, have largely replaced civil defense, whose original focus was protecting civilians from military attack. Modern thinking focuses on a more general intent to protect the civilian population in times of peace as well as in times of war. The term Civil Protection is widely used within the European Union to refers to government-approved systems and resources whose task is to protect the civilian population, primarily in the event of natural and human-made disasters. Within EU countries the term Crisis Management emphasizes the political and security dimension rather than measures to satisfy the immediate needs of civilians. Organizations dedicated to disaster relief and helping people out of dangers began to spring up in the 1800s. Before this, various guilds and mutual aid societies performed in a similar way, but only to the people who were within the organization. International organizations such as Red Cross, the original international relief society, who worked selflessly for the benefit of everyone in any walk of life, are a relatively new innovation. The beginnings of the Red Cross started in 1863, with the Geneva Public Welfare Society calling a committee to investigate the idea of an organization aiding and protecting the sick and wounded in combat situations. The committee soon became the International Committee of the Red Cross. At the Geneva Convention of 1864, the formal symbol of the red cross on a white background was adopted, and neutrality for Red Cross workers on battle fields was ensured. Since this convention, the reach of the Red Cross has been extended to civilians. The most significant addendum was in 1949, ensuring protection from almost every conceivable disaster, whether military or non-military. Almost every Red Cross in every country where they are present has disaster relief programs. After the creation and rise of the Red Cross, various countries implemented their own disaster relief programs. More international relief societies also emerged. Today, most countries have a disaster relief program of some sort, and the Red Cross is present in any situation where assistance is needed. A graphic representation of the four phases in emergency management. The nature of emergency management is highly dependent on economic and social conditions local to the emergency, or disaster. This is true to the extent that some disaster relief experts, such as Fred Cuny, have noted that in a sense the only real disasters are economic. The cycle of emergency management must, therefore, include long-term work on infrastructure, public awareness, and even human justice issues. This is particularly important in developing nations. Mitigative measures can be structural or non-structural. Structural measures use technological solutions, like flood levees. Non-structural measures include legislation, land-use planning (such as the designation of nonessential land like parks to be used as flood zones), and insurance. Mitigation is the most cost-efficient method for reducing the impact of hazards. However, mitigation is not always suitable and structural mitigation in particular may have adverse effects on the ecosystem. A precursor activity to the mitigation is the identification of risks. Physical risk assessment refers to the process of identifying and evaluating hazards. In risk assessment, various hazards (earthquakes, floods, riots, and so forth) within a certain area are identified. Each hazard poses a risk to the population within the area assessed. The hazard-specific risk combines both the probability and the level of impact of a specific hazard. It is said that the hazard in accordance with the populations vulnerability to disasters or dangers show the degree of risk for a population. Of course, there are contributing factors to both hazard and vulnerability. Population size, whether disasters occurred in the area previously, how recent the last disaster was, how much government aid is being pushed into disaster preparation, and how many people decide to leave the area before an imminent disaster are all to be taken into consideration when accounting for risk. Catastrophe modeling tools are used to support the calculation. The higher the risk, the more urgent that the hazard specific vulnerabilities are targeted by mitigation and preparedness efforts. However, if there is no vulnerability there will be no risk, for example, an earthquake that occurs in a desert where nobody lives. An example of personal non-structural mitigation would be to avoid buying property that is exposed to hazards, such as in a flood plain, in areas of subsidence or landslides. Homeowners may not be aware of their home being exposed to a hazard until it strikes. Real estate agents may not come forward with such information. However, specialists can be hired to conduct risk assessment surveys. Insurance covering the most prominent identified risks are a common measure. Personal structural mitigation in earthquake-prone areas include installation of an earthquake valve to instantly shut off the natural gas supply to the property, seismic retrofits of property, and the securing of items inside the building to enhance household seismic safety, such as the mounting of furniture, refrigerators, water heaters, and breakables to the walls, and the addition of cabinet latches. In flood prone areas, houses can be built on poles, like in much of southern Asia. In areas prone to prolonged electricity black-outs, a generator would be an example of an optimal structural mitigation measure. The construction of storm cellars and fallout shelters are further examples of personal mitigative actions. In the preparedness phase, emergency managers develop plans of action for when the disaster strikes. Common preparedness measures include the communication of plans with easily understandable terminology and a chain of command, along with the development and practice of multi-agency coordination and incident command. Proper maintenance and training of emergency services is also important. Developing and exercising an emergency population warning, construction plans for emergency shelters, and emergency evacuation plans are all of utmost importance. Survival is also dependent upon stockpiling inventory and supplies, which should be done in bulk, or at least substantial numbers. An efficient preparedness measure is an emergency operations center (EOC) combined with a practiced region-wide doctrine for managing emergencies. Another preparedness measure is to develop a volunteer response capability among civilian populations. Since volunteer response is not as predictable and coordinated as professional response, volunteers are most effectively deployed on the periphery of an emergency. Unlike mitigation activities, which are aimed at preventing a disaster from occurring, personal preparedness focuses on preparing equipment and procedures for use when a disaster occurs. Preparedness measures can take many forms including the construction of shelters, installation of warning devices, creation of back-up life-line services (power, water, sewage), and rehearsing evacuation plans. Two simple measures can help prepare the individual for sitting out the event or evacuating, as necessary. For evacuation, a disaster supplies kit may be prepared and for sheltering purposes, a stockpile of supplies may be created. The preparation of a survival kit, commonly referred to as a "72-hour kit," is often advocated by authorities. These kits may include food, medicine, flashlights, candles, and money. The response phase includes the mobilization of the necessary emergency services and first responders in the disaster area. This is likely to include a first wave of core emergency services, such as firefighters, police, and ambulance crews. They may be supported by a number of secondary emergency services, such as specialist rescue teams. In addition, volunteers and non-governmental organizations (NGOs) such as the local Red Cross branch or St. John Ambulance may provide immediate practical assistance, from first aid provision to providing tea and coffee. A well rehearsed emergency plan developed as part of the preparedness phase enables efficient coordination of rescue efforts. Emergency plan rehearsal is essential to achieve optimal output with limited resources. In the response phase, medical assets will be used in accordance with the appropriate triage of the affected victims. Where required, search and rescue efforts commence at an early stage. Depending on injuries sustained by the victims, outside temperature, and victims' access to air and water, the vast majority of those affected by a disaster will die within 72 hours after impact. Individuals are often compelled to volunteer directly after a disaster. Volunteers can be both a help and a hindrance to emergency management and other relief agencies. A spontaneous, unaffiliated volunteer can harm recovery efforts. Whereas volunteers under the direction of an organizing agency, such as the Caritas Network, can provide solutions to the long term effects of a disaster. On a personal level, the response can take the shape either of a home confinement or an evacuation. In a home confinement scenario, a family should be prepared to fend for themselves in their home for many days without any form of outside support. In an evacuation scenario, a family evacuates by an automobile (or other mode of transportation) with the maximum amount of supplies, including a tent for shelter. The scenario could also include equipment for evacuation on foot with at least three days of supplies and rain-tight bedding. A tarpaulin and a bedroll of blankets is the minimum. The aim of the recovery phase is to restore the affected area to its previous state. 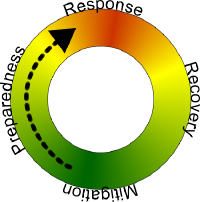 It differs from the response phase in its focus; recovery efforts are concerned with issues and decisions that must be made after immediate needs are addressed. Recovery efforts are primarily concerned with actions that involve rebuilding destroyed property, re-employment, and the repair of other essential infrastructure. An important aspect of effective recovery efforts is taking advantage of a "window of opportunity" for the implementation of mitigative measures that might otherwise be unpopular. Citizens of the affected area are more likely to accept more mitigative changes when a recent disaster is in fresh memory. The recovery phase starts when the immediate threat to human life has subsided. In this phase, it is recommended to reconsider the location or construction material of the property. In long term disasters, the most extreme home confinement scenarios like war, famine, and severe epidemics last up to a year. In this situation, the recovery will take place inside the home. Planners for these events usually buy bulk foods and appropriate storage and preparation equipment, and eat the food as part of normal life. A simple balanced diet can be constructed from vitamin pills, whole-meal wheat, beans, dried milk, corn, and cooking oil. Vegetables, fruits, spices, and meats should be added when possible. Emergency managers are trained in a wide variety of disciplines that support them throughout the emergency life-cycle. Professional emergency managers can focus on government and community preparedness (Continuity of Operations|Continuity of Government Planning), or private business preparedness (Business Continuity Management Planning). Training is provided by local, state, federal and private organizations. It ranges from public information and media relations to high-level incident command and tactical skills such as studying a terrorist bombing site or controlling an emergency scene. In the past, the field of emergency management has been limited to mostly men from a military or first responder background. Currently, the field is as diverse as any with many experts from a variety of backgrounds with no military or first responder history at all. Professional accreditation standards have also been put in place. The Certified Emergency Manager (CEM) and Certified Business Continuity Professional (CBCP) are becoming more common place as the need for high professional standards is recognized and accepted by the emergency management community, especially in the United States. The continuity feature of emergency management resulted in a new concept, Emergency Management Information Systems (EMIS). For continuity and interoperability between the emergency management stakeholders, EMIS support the emergency management process by providing an infrastructure that integrates emergency plans at all levels of government/non-government involvement and by utilizing the management of all related resources (including human resource and other resources) for all four phases of emergencies. Red Cross/Red Crescent societies often have pivotal roles in responding to emergencies. Additionally, the International Federation of Red Cross and Red Crescent Societies (IFRC, or "The Federation") may deploy assessment teams to the affected country. They specialize in the recovery component of the emergency management framework. Within the United Nations system, responsibility for emergency response rests with the Resident Coordinator within the affected country. However, in practice international response will be coordinated, if requested by the affected country’s government, by the UN Office for the Coordination of Humanitarian Affairs (UN-OCHA), by deploying a UN Disaster Assessment and Coordination (UNDAC) team. International Association of Emergency Managers (IAEM) is a non-profit educational organization dedicated to promoting the goals of saving lives and protecting property during emergencies and disasters. The mission of IAEM is to serve its members by providing information, networking and professional opportunities, and to advance the emergency management profession. Australia has the federal government agency Emergency Management Australia (EMA) as the key federal coordinating and advisory body for emergency management. Each state has their own State Emergency Service. The Emergency Call Service provides a national 000 emergency telephone number to state Police, Fire and Ambulance services. Arrangements in place for state and federal cooperation. Public Safety Canada is Canada’s national emergency management agency. Each province has a mandate to set up their Emergency Management Organizations. PSC also coordinates and supports the efforts of federal organizations ensuring national security and the safety of Canadians. They also work with other levels of government, first responders, community groups, the private sector (operators of critical infrastructure)and other nations. PSC’s work is based on a wide range of policies and legislation. Through the Public Safety and Emergency Preparedness Act which defines the powers, duties and functions of PSEPC are outlined. Other acts are specific to fields such as corrections, emergency management, law enforcement, and national security. In Germany, the Federal Governmemt controls the German Katastrophenschutz (disaster relief) or Zivilschutz (civil defense) programs. 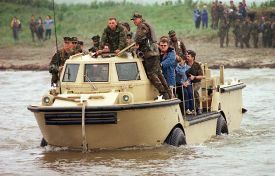 Particularly the German fire department and the Technisches Hilfswerk (Federal Agency for Technical Relief, THW) are part of these programs. Also, the German Armed Forces (Bundeswehr) can be deployed for disaster relief operations. In New Zealand, the Ministry of Civil Defence & Emergency Management has statutory authority for controlling any state of emergency declared by central government. Local government bodies such as city and regional councils have their own emergency management agencies to control localized states of emergency, but these all defer to the MCDEM in the event of a national state of emergency. The Wellington Emergency Management Office utilize a building that has been purpose built with its own water, electricity, communications, and sewerage facilities to ensure operations in the event of an emergency or disaster. The United Kingdom adjusted its focus on emergency management following the 2000 UK fuel protests, severe UK flooding in the same year and the 2001 UK foot and mouth crisis. This resulted in the creation of the Civil Contingencies Act 2004, which legislated the responsibilities of all category one responders regarding an emergency response. The United Kingdom’s management of the CCA is through the Civil Contingencies Secretariat through regional disaster centers and at the local authority level. Disaster Management training is generally conducted at the local level by the organizations involved in any response. This is consolidated through professional courses that can be undertaken at the Emergency Planning College. Furthermore, diplomas and undergraduate qualifications can be gained throughout the country—the first course of this type was carried out by Coventry University in 1994. The UK’s largest ever emergency exercise was carried out on May 20, 2007 near Belfast, Northern Ireland, and involved the scenario of a plane crash landing at Belfast International Airport. Staff from five hospitals and three airports participated in the drill, and almost 150 international observers assessed its effectiveness. In the United States, the Department of Homeland Security (DHS) and the Federal Emergency Management Agency (FEMA) are the lead agencies for emergency management. The HAZUS software package developed by FEMA is central in the risk assessment process in the country. The United States and its territories are covered by one of ten regions for FEMA’s emergency management purposes. Tribal, state, county, and local governments develop emergency management programs/departments and operate hierarchially within each region. Emergencies are managed at the most local level possible, utilizing mutual aid agreements with adjacent jurisdictions. If the emergency is terrorist related or if declared an "Incident of National Significance," the Secretary of Homeland Security will initiate the National Response Plan (NRP). Under this plan, the involvement of federal resources will be made possible, integrating in with the local, county, state, or tribal entities. Management will continue to be handled at the lowest possible level utilizing the National Incident Management System (NIMS). The Citizen Corps is an organization of volunteer service programs, administered locally and coordinated nationally by DHS, which seeks to mitigate disaster and prepare the population for emergency response through public education, training, and outreach. Community Emergency Response Teams are a Citizen Corps program focused on disaster preparedness and teaching basic disaster response skills. These volunteer teams are utilized to provide emergency support when disaster overwhelms the conventional emergency services. A problem faced by FEMA in the United States is that there is no policy in the United States that discourages people from moving into high risk areas. For example, flood insurance in high risk flood areas has been restricted because the losses out weighed the premiums. When a flood occurs, the federal government grants the community the money and resources to rebuild the area bigger after disasters, but no money is allocated to flood prevention and protection. Some argue that people would be more prepared for flooding if the federal safety net was not there, others argue that disaster relief is an entitlement and should be mobilized no matter how prepared the area is for disaster. ↑ 1.0 1.1 Jeffrey Lehman and Shirelle Phelps, West's Encyclopedia of American Law (Thomson Gale, 2004, ISBN 978-0314201560). ↑ 2.0 2.1 Nobel Prize, International Committee of the Red Cross. Retrieved November 3, 2018. ↑ Fred Cuny, Disasters and Development (Oxford University Press, 1983, ISBN 978-0195032932). ↑ 4.0 4.1 4.2 4.3 4.4 4.5 George Haddow and Jane Bullock, Introduction to Emergency Management (Amsterdam: Butterworth-Heinemann, 2004, ISBN 0750676892). ↑ Ben Wisner, At Risk-Natural Hazards, People’s Vulnerability and Disasters (Routledge, 2003, ISBN 978-0415252164). ↑ Department of Homeland Security, Build A Kit Ready.gov. Retrieved November 3, 2018. ↑ 7.0 7.1 7.2 David Alexander, Principles of Emergency Planning and Management (Oxford University Press, 2002, ISBN 978-0195218381). ↑ Federal Emergency Management Agency, Homepage. Retrieved November 3, 2018. ↑ BBC News, Mock Plane Crash Tests NI Crews. Retrieved November 3, 2018. ↑ Susan Cutter, Preparing for Emergencies Encyclopedia Britannica. Retrieved November 3, 2018. Alexander, David. Principles of Emergency Planning and Management. Oxford University Press, 2002. ISBN 978-0195218381. Bankoff, Greg. Mapping Vulnerability: Disasters, Development and People. Earthscan Publications, 2004. ISBN 978-1853839641. Benson, Charlotte, and Edward Clay. Understanding the Economic and Financial Impacts of Natural Disasters. World Bank Publications, 2004. ISBN 978-0821356852. Cuny, Fred. Disasters and Development. Oxford University Press, 1983. ISBN 978-0195032932. Haddow, George, and Jane Bullock. Introduction to Emergency Management. Amsterdam. Butterworth-Heinemann, 2004. ISBN 0750676892. Lehman, Jeffrey, and Shirelle Phelps. West's Encyclopedia of American Law. Thomson Gale, 2004. ISBN 978-0314201560. Wisner, Ben. At Risk-Natural Hazards, People’s Vulnerability and Disasters. Routledge, 2003. ISBN 978-0415252164. Ready.gov United States Department of Homeland Security. Emergency Management Related Training FEMA. Texas Search and Rescue TEXSAR. MapAction NGO producing maps in disaster emergencies. United Nations International Strategy for Disaster Reduction. Natural Hazards and Earth System Sciences An Interactive Open Access Journal of the European Geosciences Union. This page was last modified on 6 November 2018, at 15:07.